New to the site, not new to Early Broncos. I also have a 77 f150 4x4, will be selling soon. I'm here in the Columbia area. I appreciate Chris at CFS for recommending me to the site. I'm also a member on Carolina Broncos' and Classic Broncos' websites. Post some pics of the bronco. My wife has always wanted one. She passed up the opportunity to buy one from family a while back and has regretted it. 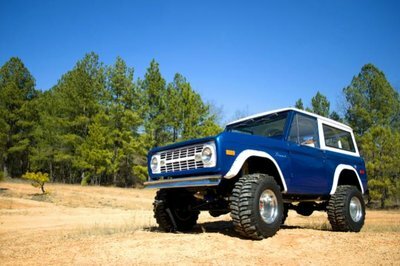 Nice to have another ford guy on here, I'd love to see the early bronco out riding sometime. Thx guys, can't add pics yet. I don't have permission to this website. I sold my 76 bronco last year to buy a new roof and new Htg and air condition, momma wants to stay dry and cool! But I couldn't stay away too long and bought a 77 bronco frame with matching title. I have been slowly buying all the pieces, kept my skinny 33s from my old 76. Just bought a 5.0 efi from another early bronco, will go with a standard c6. 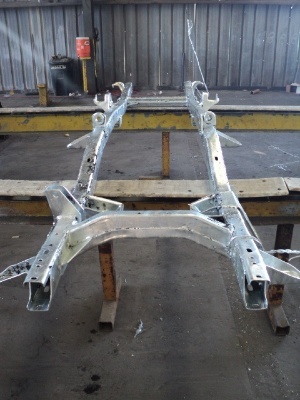 Just had the frame galvanized and is getting ready for powder coat. Are you going to build the 77 with original parts or are you doing a reproduction body? It appears i have figured out the posting pics thing. But anyways I bought an uncut 72 body, will do the my best to make it look like a 77 body. Only difference in both years is the fuel door. I have new front fenders and the rest of the body parts are used but in great shape. I have a family roll-cage I need to pick up in Charlotte soon. I also have a hardtop I need to pick up in Raleigh. Only big ticket items I need to get are seats, doors and 3.5" suspension lift. Gotta sell my 77 F150 first, funds are slowing down. If I went with an aftermarket tub/body it would run me well over $10k! Prices on early broncos have gotten rediculous! As you can see it already has a 6" body lift! Sounds like a great project. I love early broncos, me and my dad built one when I was in high school. Seems the blue and white paint scheme is pretty common. That 76 is a good looking Bronco. Hope the new one turns out just as good. Has to be fun starting from the bottom up. Lots of EBs up by you. Nope, my name is Heath. I am new to the forum. Just moved to Greenwood. Sorry Heath. There are two guys in Gr'wood that are big in EBs. If you are looking for parts, hit up Jbass on Carolina Broncos or Classic Broncos websites. I see you signed on CB4x4, intro urself on there and post some pics of your bronco! Thanks. I had planned on posting an intro on the CB4x4 page. Thanks for the heads up about parts. I am always looking fo something. Him and another fella have lots of broncos and many parts as well. They are bronco hoarders! A little update if this thread hasn't been archived. I've been deployed to Poland 2015 and S. Korea 2016. Both times were amazing, especially Poland. I got my bronco frame regalvanized and had Styuck powdercoat it. Big thx to Chris and his crew. Also had Chris powdercoat many other pieces in the undercarriage. Now I'm working on rebuilding the rear 9" axle and it's housing. I've added some drain plugs and bungs. New seals and new axle shaft bearings being pressed on this weekend. I'm not sure what I will do with my housing. I may have it powdercoated but I'm worried about the surface rust on the inside. I heard of a company in Conessee SC that zinc coats metal so I may look into that option. There's another coating company in Laurens SC. I'm looking for something that removes rust and leaves one helluva corrosion resistant coating that I can paint POR 15 over. Will move from Introduction to Builder thread.